Leela, a “most wanted’ criminal, was killed along with his accomplice in a police encounter today while one of his associates, who was injured in the firing, managed to escape. The police had announced a reward of Rs 50,000 on the head of Leela. The Dakshin Haryana Bijli Vitran Nigam has decided to extend the benefits of the electricity bill arrear waiver scheme to panchayat tube-wells, village community centres and chaupals also as these get power supply under the domestic category. The promotion of two IAS officers of Haryana was held up while two others of the same batch were today promoted Financial Commissioner and Principal Secretary. Haryana’s contribution to the freedom struggle is often blurred in contrast to its neighbour Punjab. It is a little known fact that about 2000 persons in the East Punjab (now called Haryana), were done to death as punishment for participating in the 1857 revolt. Residents of Sarsehri village, including the family members and relatives of Raj Kumar, who died after he was shot at yesterday, blocked the busy Ambala-Jagadhari road this evening. The protesters placed the victim's body on the road and the blockade led to a major traffic jam. The Punjab and Haryana High Court today directed the Haryana Government to issue fresh advertisement notice inviting applications for opening shops in various government hospitals. The Model Town police here has arrested Atma Ram Bishnoi, Deputy Superintendent of jail, and Kamal Singh, Head Warder of the district jail on the charges of negligence shown in the grave matter pertaining to the escape of an under-trial prisoner and notorious criminal Jeet Ram, alias Jeeta, from the district jail here yesterday. Former Union Minister Chand Ram has urged Chief Minister Bhupinder Singh Hooda to fill 27,000 reserved vacancies expeditiously. In a statement issued here today, he said the backlog of reserved posts must be cleared as these had not been filled for several years depriving educated youths from the Scheduled Castes of a chance to earn their livelihood. Apollo Circus, which has arrived at Ambala, can claim to be the launching pad of Shahrukh Khan. The teleserial “Circus” launched Shahrukh Khan. The serial was shot entirely at Apollo Circus. The Haryana Government has reconstituted the Haryana Swatantrata Sainik Samman Samiti and appointed Mr Puran Chand Azad of Rohtak district chairman for a period of one year. Leela, a “most wanted’ criminal, was killed along with his accomplice in a police encounter today while one of his associates, who was injured in the firing, managed to escape. The police had announced a reward of Rs 50,000 on the head of Leela. Unfortunately, a girl was also killed and another person was injured in the firing. Superintendent of Police Saurabh Singh, Deputy Superintendent of police Bijender Singh, Deputy Commissioner Sri Kant Valgad and IG (Hisar) Mahender Lal reached the spot. Talking to mediapersons, Mr Lal said a miscreant, identified as Manoj, had fired upon an under-trial prisoner Satender, an accused in the case of Ramesh Masta murder case, when he was being taken to the court for hearing yesterday. Satender sustained bullet injuries and was admitted to the Civil Hospital. He said Manoj and Kalu had arrived on a motorcycle in the court. Kalu remained outside the court and Manoj entered the court where he shot a fire on Satender. The police overpowered the assailant and the CIA police interrogated him. The accomplice had fled from the scene. Mr Lal said several police parties were constituted and barricades were put up on the main roads of the town. The police, he said, noticed a Santro car (No. HR 06 F 2223) at about 8.30 am today near Vikas Nagar, Rohtak road and tried to stop it but the driver, instead, increased the speed. Meanwhile, a black Esteem car (No. CH 03 F 3769) arrived there and the occupants started firing on the police. The police retaliated and followed the duo car. A girl, identified as Vandana, daughter of Ramesh of Bharat Nagar, was killed in the firing. Two miscreants were killed in the cross firing and one sustained bullet injuries. One of the killed has been identified as notorious criminal Leela of Sisay village. Over five-dozen cases of murder, abduction, extortion and dacoity were registered against Leela and the police had announced a reward of Rs 50,000 on his head. Another person, who was killed, was a constable of the Haryana Police. He has been identified as Puneet Yadav of Bhiwani. He had been recruited under the CSO three years back. Puneet had given shelter to Leela last night. The criminal, who sustained bullet injury in his leg, managed to escape. The police recovered two revolvers and live cartridges from the possession of the criminals. Mr Lal expressed deep concern on the death of an innocent girl and said that the cause of death would be ascertained. Mr Lal said the police would honour Ravinder, who helped to nab the assailant Manoj in the court premises yesterday and a cash reward of Rs 25 thousand would be given to him. He added that those police personnel, who accomplished this task, would also be honoured. The Bhiwani MLA, Dr Shiv Shankar Bhardwaj, has expressed deep shock on the sad demise of Vandana, who was killed in the cross firing. In a statement issued by Dr Kamla Bhardwaj, wife of Dr Bhardwaj, said Dr Bhardwaj had talked to the Chief Minister, Mr Bhupinder Singh Hooda, DC and the SP and asked to inquire the whole incident. She said the Chief Minister had announced Rs 4 lakh and government service to a relative of the deceased and Rs 25,000 to the injured person. The Dakshin Haryana Bijli Vitran Nigam (DHBVN) has decided to extend the benefits of the electricity bill arrear waiver scheme to panchayat tube-wells, village community centres and chaupals also as these get power supply under the domestic category. Clarifying this, a spokesman for the nigam said here today that since the scheme was meant for rural domestic and agriculture consumers and these consumers are under the domestic category, these become entitled for the benefit of the bill waiver scheme. He said the facility of reconnection of permanent disconnected tube-well and domestic connections in the rural areas would be available up to August 31, 2005 under the bills waiver scheme. Under the scheme, permanently disconnected domestic and agricultural consumers of rural areas, who were defaulters as on June 16, 2005, can apply for reconnection by depositing advance consumption deposit (ACD), meter cost and reconnection fee. They will not be charged minimum monthly charges for the period of disconnection prior to June 16. In case of tube-well connection, a fee of Rs 1,000 for disconnected consumer for less than six months period and Rs 2,000 where the period of disconnection is more than six months will be charged. Where the high tension/low tension (HT/LT) lines are required to be erected, the reconnection shall be allowed by charging 50 per cent of the cost of erection of the lines. Rest of the 50 per cent of the cost would be borne by the DHBVN. The cost of augmentation of transformer or installation of new transformer would be borne by the DHBVN. The spokesman said that the consumers whose connections had been cut would be allowed to get benefit of waiver of arrears of electricity bills standing against them in case they come forward for reconnection. Meanwhile, taking benefit of voluntary disclosure scheme for unauthorised extension of load, 82,000 consumers under domestic, non-domestic and agriculture categories have declared 255 megawatt (MW) load in the state and got the load regularised without paying any penalty. The Voluntary Disclosure Scheme (VDS) will remain operative up to August 15, 2005 in its present form. The scheme would be available from August 16 to September 15 also, but during that period, the consumers will have to pay 30 per cent extra charges for getting the unauthorised load regularised. The promotion of two IAS officers of Haryana was held up while two others of the same batch were today promoted Financial Commissioner and Principal Secretary. Mr Sajjan Singh, Commissioner and Secretary, Sports Department, and Mr Ramendra Jakhu, Commissioner and Secretary, Transport Department, were promoted Financial Commissioner and Principal Secretary in the pay scale of Rs 22400-525-24500 with immediate effect. They will continue with their present assignments. Both officers belong to the 1979 batch of the IAS. Two other officers of the batch, Mr Ajit Mohan Sharan, Commissioner and Secretary, Technical Education, and Mr Sunil Kumar Saxena, OSD, Planning Board, whose names figure before those of Mr Sajjan Singh and Mr Jakhu in the gradation list of IAS officers of Haryana, however, were not promoted. Mr Sudhir Rajpal, who was transferred from the post of Deputy Commissioner of Gurgaon following violence between workers and the police, was posted as Administrator, HUDA, Faridabad. This and many other documents related to the contributions made by Haryana in the struggle for freedom from the British Raj, have now been opened for public viewing by the Archives Department, Haryana. These documents, which validate the various uprisings against the British rule here, are being showcased at the Sinchai Bhavan here to commemorate the anniversary of Quit India movement. Beginning with documents on the mutiny by soldiers of the 5th and 60th Regiments on May 10, 1857, to the uprisings by government officials in Sonepat in 1930; and from conviction of freedom fighters of Rohtak during the Non-Cooperation movement in 1922 to banning of all Congress units by the Commissioner, Lahore in 1942 — the Archives Department has put together the chronology of freedom movement in this part of the country. Informs Ms Rajrani, Deputy Director, Archives Department, “In 1857, India was still under the rule of Bahadur Shah Zafar, the 10th Mughal emperor. A large number of Muslims were residing in Haryana, and had played a pivotal role in the uprising. About 50 per cent of those hanged by the British after having crushed the 1857 revolt in this part of the country were Muslims”. She shows a list of these persons, who were ‘punished’. These documents show how there was tension in the Umballa (Ambala) cantonment right from March 1857, because of the beef -laced cartridges being given to jawans of the East India Company. But after news of the Revolt in Meerut reached Umballa, the soldiers in Umballa, too, revolted, which was followed by revolts in Karnal, Kaithal and Panipat. 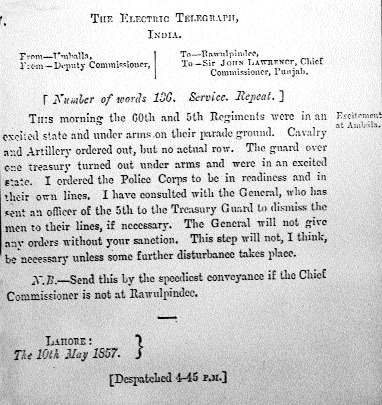 A telegram sent by the then Deputy Commissioner, Umballa, to Sir John Lawrence, Chief Commissioner, Punjab, stating that the jawans had taken control of arms in Parade Grounds, Umballa on May 10, 1857, is also on display. Another interesting document being showcased by the Archives Department is the original revenue district of Hurriana in 1832 (now comprising of districts of Fatehabad, Bhiwani and parts of Jhajjar). List of leaders from this region who attended the Fifth Session of the Indian National Congress in 1889- Chaudhary Ganga Ram, Lala Gauri Shankar, Lala Dwarka Parshad, and Ms Jessie Royce Carleton, on display, as are documents to prove how Nishat Talkies in Ambala continued to act as a ‘safe haven’ for the revolutionaries to prepare and distribute their propaganda material. The blockade was started at about 4.15 pm and lifted only after two hours when SP Rajbir Deswal and DC J.P. Kaushik assured prompt action in the case. The residents demanded the arrest of the accused. They raised slogans against the police and alleged that it had failed to take appropriate action. Mr Mahinder Singh, brother of the victim, said Raj Kumar had been receiving threats for the past one year. “We had informed the police and my brother was provided security for about six months for which he had to pay. After the period when he failed to make payment due to financial problems the security was withdrawn," he claimed. He stated that the two persons who shot him had come to extort money. "After the incident, we too received threatening calls from the assailants twice. Our life is in danger and the police is doing nothing,” he said. The entire exercise of allotment of shops would be completed in two months from today and the same would be done as per government policy. The Bench of Mr Justice N.K. Sud and Mr Justice Virender Singh also ordered that till the completion of the process, two respondents, who had been allotted the tender for operating shops, including a chemist shop, at the Civil Hospital, Panchkula, would continue to run the shops till the completion of the fresh process. The Bench was disposing of the petition filed by the Chemists Association, Panchkula and others, seeking quashing of the allotment of shops to the two private respondents in violation of norms and tender rules. In their petition, the chemists had stated that as per notice issued by the government on April 3, 2004, NGOs and charitable institutions could only apply to run shops in government hospitals. Due to this clause, the petitioners did not apply. Besides the police has also arrested Jeeta’s wife Ruchi, who had come to meet him in the jail yesterday, on the charges of criminal conspiracy leading to Jeeta’s escape. The police has also registered a case of negligence, resistance to lawful apprehension and criminal conspiracy under Sections 223, 224, 120-B of the IPC against them. Jeeta, a resident of Gujjarwara mohalla, had escaped from police custody on two previous occasions as well. He demanded allotment of residential plots to the landless from the Scheduled Castes both in urban and rural areas. He asked members of A and B groups of the Scheduled Castes not to haggle over their quotas in jobs since the apex court had declared separate reservations for these categories as ultravires of the Constitution. That’s not all. The movie, “Appu Raja”, was also shot at Apollo Circus. Not to forget, movies like “Haathi Mere Saathi” and “Tarzan” in which Apollo Circus animals and staff were used for shooting. Movie memorabilia is not on display at Apollo Circus but there will be a host of other things which the circus managers are hoping will draw crowds. Mr R.K. Yadav, circus manager, said whenever Apollo Circus travelled to Mumbai, Shahrukh Khan made it a point to come over at the circus. “Whenever any shot is required, film-makers get in touch with us and they come to our location. If the shooting has to be extensive, then we set up independent establishment for their convenience. But, that takes place only in Mumbai,” he said. The circus industry was going through a tough phase ever since their animals were taken away by the government. “We had to hand over our lions, tigers, monkeys and bear to the government. Now, we only have an elephant, horse, Australian parrot and dogs,” he said. They had bought a camel for the circus parade. “But, a camel can hardly be taught anything. It is a forgetful animal. There are times when we have to make the camel practice simple steps in the ring itself. It is a difficult situation,” he said. He claimed that while the animals were looked after properly, it did not seem so under government custody. “Tigers are vanishing from tiger reserves. When we had taken over Apollo Circus three years ago, there were 10 tigers and when we handed over the tigers, there were 18 tigers. Tiger cubs were born under our care,” he said. “The tigers which had been taken from us have been kept at Tirupati in Andhra Pradesh and we carry out periodic check of the state of our tigers,” he added. On why elephants are not banned, he said in many areas, elephants were used by the government itself to transport lumber so there was no ban. He said there was a staff of about 250 persons out of which 125 are artistes and the rest were support staff. Eighty of them are women. “We look after our animals. With regard to the artistes, if we do not establish a good rapport with the artistes, they will not work for us. Senior artistes are provided separate rooms and they come to the circus ground only at show time,” he said. Mr Hari Ram Arya of Karoli village, Rewari district, Mr Ram Daya Saini of Gohana, Sonepat district, Mr A.C.Ramsharan Arya of Karnal district, Mr Chaman Lal Ahuja of Panipat district, Mr Maha Singh of Charkhi Dadri village in Bhiwani district, Mr Lalti Ram of Jhajjar district, Mr Satya Dev of Noida in Uttar Pradesh, Mr Mahesh Datt of Panipat district and Mr M.P.Singh of Jharsa village in Gurgaon district, have been appointed non-official members. Two persons were killed and another sustained serious injuries when a three-wheeler, on which they were travelling was hit by a truck coming from the opposite direction on the railway flyover near the Sonepat-Rohtak road here last night. According to police sources, the incidents occurred around 9 p.m. The truck driver fled after leaving the vehicle on the spot. A case has been registered. The Special Lok Adalats scheduled for August 20 and August 27 at Jind, Safidon and Narwana have been postponed to September 10.